YOKOSUKA, KANAGAWA PREF. - The mother of a U.S. Navy sailor who survived a direct hit to his sleeping berth during a collision at sea said her son kept diving to try to save his shipmates until the flooded berth began running out of air pockets, while others — believing the ship was under attack — hurried to man the guns. 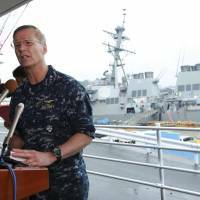 Mia Sykes, of Raleigh, North Carolina, said Sunday that her 19-year-old son, Brayden Harden, was knocked out of his bunk by the impact and water immediately began filling the berth after the USS Fitzgerald collided with a Philippine-flagged containership four times its size off the Izu Peninsula in Shizuoka Prefecture. The Coast Guard initially said the collision occurred at 2:20 a.m. Saturday because the Philippine ship had reported it at 2:25 a.m. and said it just happened. After interviewing Filipino crew members, the Coast Guard changed the collision time Monday to 1:30 a.m., when the U.S. Navy said most of the 300 sailors on board would have been sleeping. Sykes said her son told her that four men in his berth, including those sleeping on bunks above and below him, died, while three died in the berth above his. 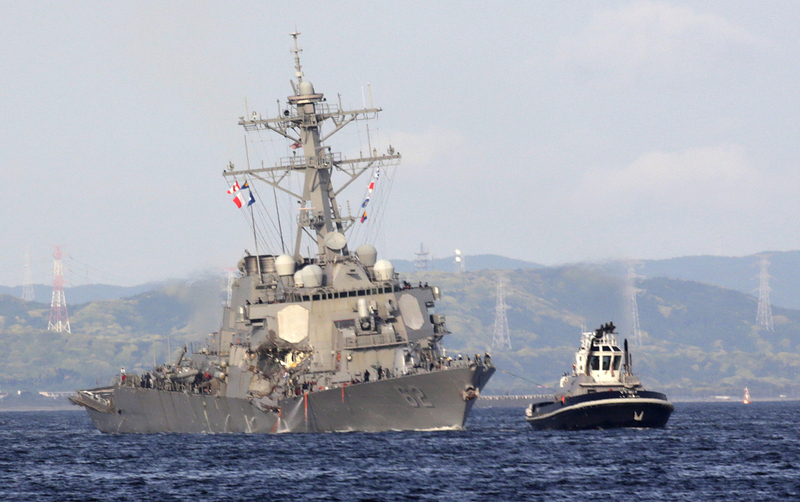 Vice Adm. Joseph Aucoin, the commander of the U.S. 7th Fleet, also described a harrowing scene as other sailors fought to keep the ship from sinking. Most of the damage was below the waterline, including a large gash near the keel, Aucoin said. “So the water flow was tremendous, and so there wasn’t a lot of time in those spaces that were open to the sea. And as you can see now, the ship is still listing, so they had to fight the ship to keep it above the surface. It was traumatic,” Aucoin said. 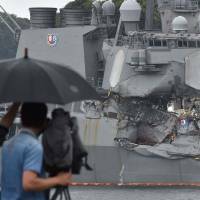 The navy called off the search for seven missing sailors Sunday after divers found a number of bodies in the ship’s flooded compartments, including sleeping quarters, Aucoin said at a news conference at the 7th Fleet’s home base in Yokosuka, Kanagawa Prefecture. The navy on Monday identified the dead sailors as Dakota Kyle Rigsby, 19, from Palmyra, Virginia; Shingo Alexander Douglass, 25, from San Diego, California; Ngoc T Truong Huynh, 25, from Oakville, Connecticut; Noe Hernandez, 26, from Weslaco, Texas; Carlos Victor Ganzon Sibayan, 23, from Chula Vista, California; Xavier Alec Martin, 24, from Halethorpe, Maryland; and Gary Leo Rehm Jr., 37, from Elyria, Ohio. Aucoin said one machinery room and two berthing areas for 116 crew members were severely damaged from what he called a significant impact to its side. 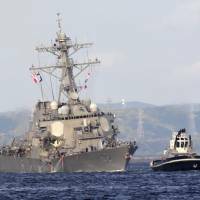 The destroyer, which was struck on the starboard side, returned to Yokosuka on Saturday evening with the help of tugboats. 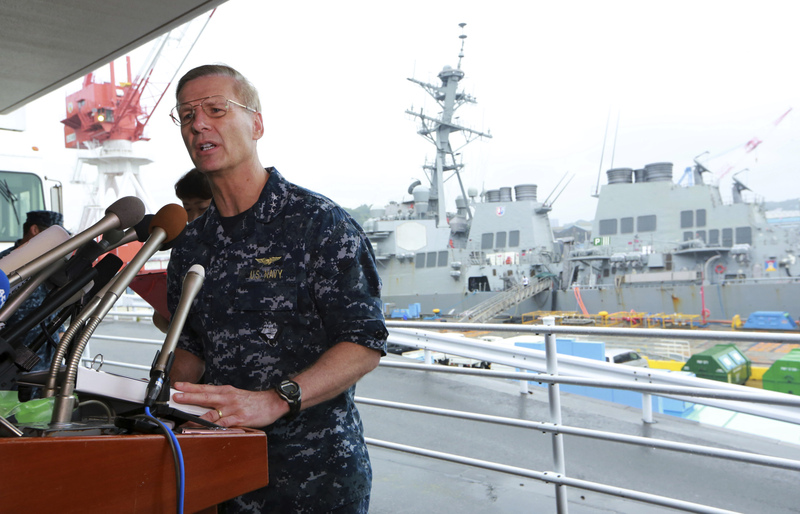 The victims might have been killed by the impact of the collision or drowned in the flooding, said navy spokesman Lt. Paul Newell, who led the media on a visit to get a firsthand look at the mangled destroyer. The Fitzgerald’s captain, Cmdr. Bryce Benson, was airlifted from the ship’s deck after daybreak Saturday to a U.S. naval hospital in Yokosuka with a head injury. Two other crew members with cuts and bruises were also flown out by helicopter. Aucoin wouldn’t speculate on the cause of the collision. Conditions were clear at the time of the collision, though the area is particularly busy with sea traffic. 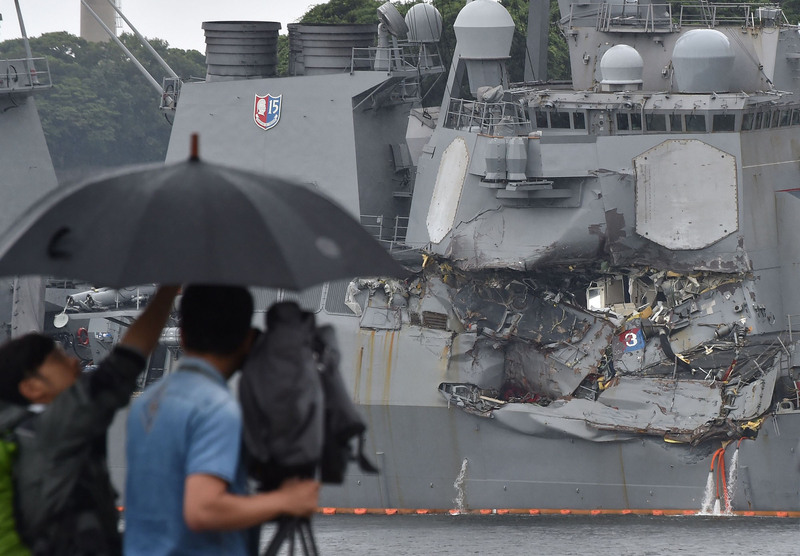 The damage to the destroyer suggests that the containership, the ACX Crystal, might have slammed into it at a high speed, raising questions about communications between the two vessels in an area where as many as 400 ships pass through every day, according to the Japan Coast Guard. Most congestion occurs in the early hours of the day, and fast currents make it a tricky area that requires experience and skill to navigate. The ACX Crystal weighs 29,060 tons and is 222 meters long, much larger than the 8,315-ton destroyer. The containership’s left bow was dented and scraped, but it did not appear to have sustained any major structural damage when it docked in Tokyo Bay late Saturday. But on Sunday, a group of accident investigators from the transport ministry found damage to the containership that had been hidden under the waterline when it arrived the previous night. Footage from NHK showed a sharp horizontal cut across the bow area that looked like a shark’s mouth. Many scratches were also seen in the frontal area. The containership was seen making a U-turn before the collision on some ship trackers, a move that has raised questions about what happened. Both Aucoin and the Japan Coast Guard, however, said it was too early to determine what led to the collision. All of the ACX Crystal’s 20-member Filipino crew was safe, according to Nippon Yusen K.K., the shipping company that operates the ship. “The only other day I have been so overwhelmed with joy to hear my son’s voice was the day he was born,” Adkison said.